Also known as wide format printers, large format printers are capable of printing on a larger scale than your standard office printer, feeding paper from 2 feet wide up to 15 feet wide, though typically, in-house large format printers feed A1 and A0 paper. As many devices are roll fed, the width remains at A1 or A0, but the length of output can run into many metres. Large format printers are therefore used to print banners, posters, wallpaper, vehicle wraps, architectural drawings, construction plans, photographs and anything else that needs to be big! You also have the option to print onto different media types, including photo paper, technical papers and coated papers, making large format printers an extremely useful and versatile piece of business equipment. Who uses large format printers? If you have every had something printed larger than A3, then it will have been printed on a large format printer. 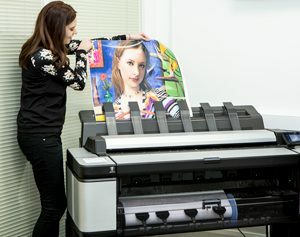 Large format printers are commonly found in the offices of architects, manufacturers, engineers, map producers, graphic design studios, production printers, schools and higher education art & design departments. 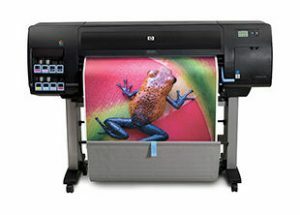 How much does it cost to buy a large format printer? Quite often, it’s the expense of investing in the actual hardware that is off putting to organisations looking to bring this work in-house. However, think about the savings that could be made by having a printer on hand, rather than having to rely on outsourcing jobs every time? When you buy a large format printer, there aren’t the mark-ups from the outsource company, or any turnaround times to consider. Turnaround times are especially important if plans or designs change and re-prints are required, giving you full flexibility and control. As a HP Gold Partner and DesignJet Production Specialist Centre, Midshire is fully accredited to supply and service this range of printers. We have the in-house expertise to recommend a large format printer based on your requirements and usage. As well as this, our Midshire engineers are trained to support and maintain the printers on-site at the customer premises. Midshire supplies the full range of HP large format printers, including HP plotters, which are specifically designed to print CAD and GIS drawings. Can I get a service agreement for a large format printer? Yes! Midshire has its own specialist Ink Inclusive’ Contract, which does exactly what it says on the tin. It’s a fully comprehensive service agreement (just like our Managed Print Service agreement) specifically created for large format printers, which is billable through the consumption of ink. Instead of paying up-front for a printer warranty, which doesn’t always include consumables such as print heads, you simply pay monthly for the ink you have consumed, just like a Managed Print Service agreement. Should you be near to running out of ink, we dispatch replacement cartridges so you have one ready for when you run out. Should you encounter any hardware issues during the contract, we’ll send one of our fully trained engineers free of charge, the costs of both these are covered in your ink bill!